Exeter Chiefs head coach Rob Baxter has said it was a "fantastic achievement" for his side to finish so close to the Premiership's top four. The Devon club missed out on a play-off place on points difference despite a 44-16 final-day win over Sale. Saracens got a big enough victory at relegated London Welsh to knock Exeter out of fourth place. "To be in the top four with 20 minutes of the season left was a fantastic achievement," Baxter told BBC Devon. "I'm very proud of the players and the way they've handled themselves this season. There's an awful lot of positives for us." 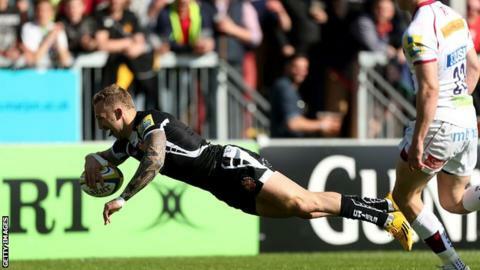 Exeter started the day in the final play-off spot by the smallest of margins, but even a bonus-point win did not prove enough. However, it is still the closest they have ever got to finishing in the top four. "I think we did what we needed to do pretty well," said Baxter. "We were probably a little bit edgy in the first half, trying to score points too quickly, and you don't tend to be able to do that in Premiership games. "The truth is it's always going to be harder to keep banging in tries against Sale than London Welsh. No disrespect to them, but what happened there is probably what people were expecting. "To bang in a 44-16 scoreline at this time of year against a decent side who are still going for something is pretty good going. You'd take that win every other weekend."